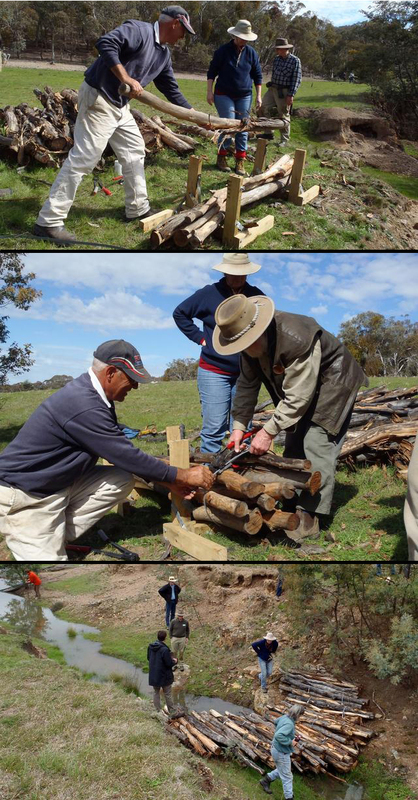 Are you interested in a practical, educational and fulfilling new activity with your Landcare group? Or perhaps a fun way for family and friends to get together and get some significant landscape repair happening on your piece of land? What, how and for whom? If you have active erosion on your property, or gullies which you would like to start repairing, we can help you out. We facilitate workshops on how to use low-cost solutions to stop active erosion, kickstart natural repair processes in gullies and begin the rehydration of the surrounding landscape. Low-cost techniques are achieved by utilising resources from on the property (or close by) which means they can easily be replicated by those who take part. Using a combination of our practical, design and education background, we ensure that participants don’t just leave with an understanding of how to build a structure, but also how and where they are placed for maximum benefit to the surrounding landscape. There are a range of activities to suit all levels of physical capability (although nothing too strenuous). Cam speaking at a Soils For Life event at Craig Carter’s property, Tallawang. Please contact us if your Landcare group is interested in a presentation on using low cost solutions to repair eroded channels and rehydrate the surrounding landscape. Cam has written a variety of articles outlining the processes and techniques for repairing and enhancing the health of the landscape. You can click on the categories on the right hand side of the page to hone in on topics which are most relevant to you. Or, click on relevant tags at the bottom of an article you enjoy.